Tennis in Portumna has a long history, dating back to 1880. Read below to find out more. 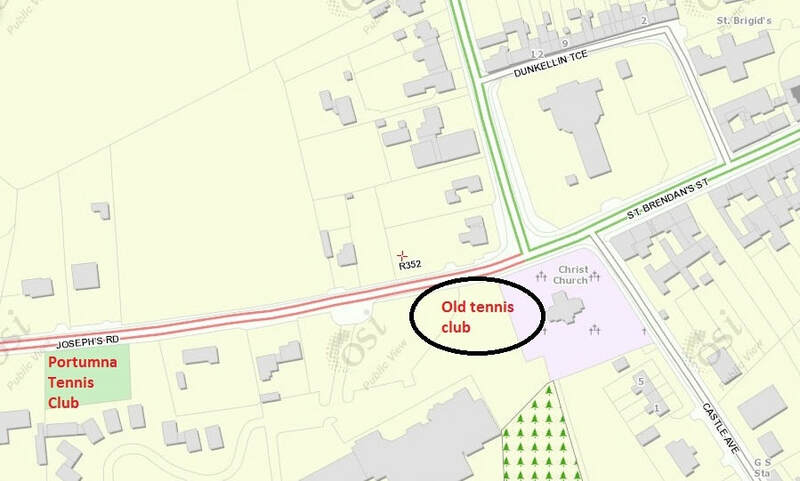 Portumna Lawn Tennis Club can be dated back as far as 1880, and in that year six grass courts were established in Portumna. The courts existed to the right of the Church of Ireland in what is now the car park of the Shannon Oaks Hotel. The Rector at the time was instrumental in securing the land for the provision of a club in Portumna. The Tennis club facility also included a wall-ball and a clubhouse where senior citizens would go regularly to socialise and play cards, bridge mainly. The wall ball was made of timber with no sides and this facility allowed patrons to practise their shots while waiting for a game. In 1913 a British vessel was commissioned to carry out a hydrological survey on Lough Derg; the vessel was known as the “Chanqsha” vessel. The crew was skippered by a man called Tommy Suggat. Tommy Suggat was captain of that vessel and spent much of his spare time as did the crew playing the game at the club in Portumna. The crew was ordered back to Britain in 1914, when world war one broke out. They donated a cup to the club called the Chanqsha cup which was made out of sterling silver. There was also a cup donated for the ladies but there was no name given to this cup. Unfortunately both cups were never returned after the last tournaments prior to 1960 and the location of these cups is unknown. In the 1920's the club was again beginning to falter. Many locals of Portumna did not want to see the tennis club faltering so the chairman of the club in 1923 was Mr. Moran who embarked on a campaign to entice more members to join and maintain membership of Portumna Lawn Tennis Club. 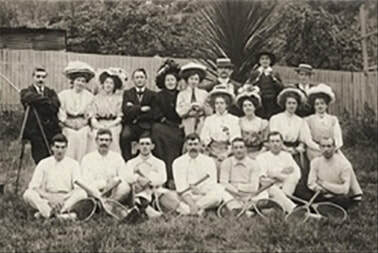 The O’Kelly family was instrumental in getting catholic families to join the club and membership of the club increased and an offshoot of table tennis came from this. The members used to have table tennis competitions in an upstairs room at Portumna Workhouse during the winter. It is interesting to note that an outdoor court also existed in the grounds of the Workhouse. The courts were kept in good condition and were taken care of by a man named Joe Coniry. Joe had made a bargain with the club that he would take care of the courts if his donkey was allowed to graze on the courts during the winter months. When there were enough members in the club, a committee was formed. When new members wanted to join the club, the committee would vote by placing white beads if they were in favour and black beads if they weren't in favour into a jar. This was a practice used by the free masons also and the term "black balled" was used when someone was excluded using this process of voting. The black beads and the white beads were counted and if the black beads outnumbered the white beads, then the prospective member could be excluded from joining the club. The Club organised competitive tennis matches against clubs in Nenagh, Birr, Athenry and BallinasIoe. It was common at the time that the ladies of the town baked delicious strawberry cakes that were consumed in the pavilion and these events became very important socially for quite a number of years. These events added another dimension to the social life of the club. Members of Portumna Lawn Tennis Club were also instrumental in starting the Portumna Players drama group. In the mid-forties a meeting was held to raise funds for a Table Tennis Club, it was proposed to stage a play to raise funds. The last Chanqsha Tennis Tournament took place in St. Mary's (1960) and the competition was won by Sean O'Dwyer but the cup was never presented because at some stage it had not been returned to the club. There is no known account of the equivalent cup for the ladies. In 1967 a number of entrepreneurial minded business men embarked on a very ambitious project. This was the provision of a hotel, ‘The Westpark Hotel’, to provide for the needs of the thriving local tourist industry. A site was secured but there was a problem with the lack of car park facilities adjacent to the hotel itself. Rev. Fr. Solan, who was curate at the time in the parish of Portumna, negotiated with the Tennis Club to give up their facility on the west side of the hotel and they would get three hard courts further out St. Joseph's Road. The Tennis Club agreed to this and they gave up six grass courts and their pavilion and agreed a hundred year lease with Town Development and the Hotel at that particular time. The Hotel provided the three courts and the Pavilion was built by the club itself. The indenture was made on the 26th of November, 1969, between Portumna Hotels Limited and the Portumna District and Development Company. Over recent years a major effort has been made to restore the facility at St. Joseph’s Road and provide tennis in Portumna yet again. This is an extremely worthwhile enterprise which offers to the youth of Portumna an added facility which will enhance not just sporting skills but also promote healthy activities in an era more and more concerned with healthy lifestyles. The committee has undertaken this initiative with the Portumna and District Development Company so that exercise, teamwork, skills development and social activity can be the hallmark of the club going forward just as it was in the past.